Kolkata Rally LIVE: West Bengal chief minister Mamata Banerjee, headlining the opposition rally in Kolkata, took the fight directly to the BJP as she said that the expiry date for the Narendra Modi government is here and today's rally marks the beginning of its end. Rolling the red carpet for several opposition leaders to take on the BJP in the Lok Sabha elections, Banerjee sought to address concerns over who would lead the alliance, saying all the opposition parties have promised to work together. "Who will be the prime minister can be decided after the Lok Sabha elections," she said. 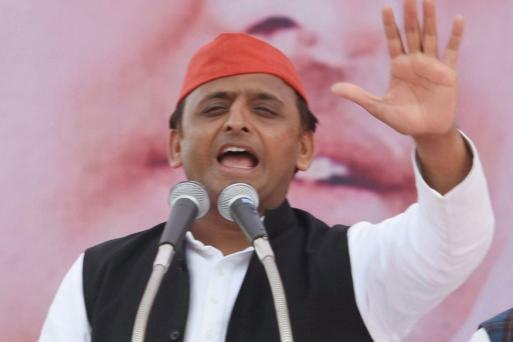 Addressing the ‘United India’ rally, former Uttar Pradesh chief minister Akhilesh Yadav said people's rights were under the threat as he attacked the Centre for curtailing people's rights. He said the 2019 Lok Sabha elections would see a fight between the alliance of the BJP, CBI and ED on one hand and the Mahagathbandhan on the other. "Those who could not see eye to eye have come together & from the speech it was evident that their only agenda is to remove Narendra Modi. They have no future road-map for the development of India," said union minister Ravi Shankar Prasad on opposition's rally in Kolkata. "We want free and fair elections, we will never accept an election won on a fraudulent basis and we fear this," said Farooq Abdullah. "Delhi CM has been raising the matter for a long time now," he added. Sketching out the strategy ahead of polls, Mamata said that Akhilesh Yadav, Abhishek Manu Singhvi and Arvind Kejriwal will comprise the committee to prepare draft on EVM and meet the Election Commission. It is important to protect democracy." She also said the opposition might meet during the upcoming parliament session. 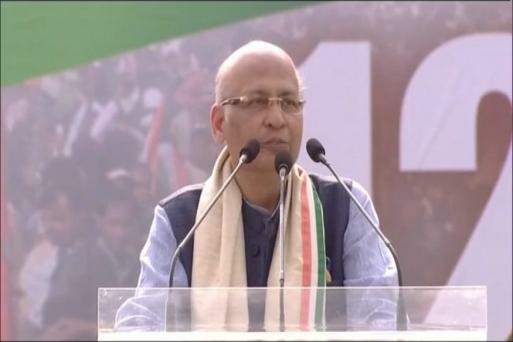 Abhishek Manu Singhvi said, "We should ensure that a strong candidate is placed against BJP at every seat. We have discussed about this as well. We also spoke about the use of physical ballot." The BJP is spreading hatred, Akhilesh Yadav said while addressing the media after United India rally in Kolkata. The Janata Dal (Secular) supremo said a small group of senior leaders should be formed to decide on a roadmap on how they will ensure good governance. Saturday called upon people to fulfill her desire in its true spirit to save the country and democracy. Prime Minister Narendra Modi targeted the 'mahagathbandhan' (grand alliance) mulled by opposition parties, calling it a combine of those he prevented from looting India. 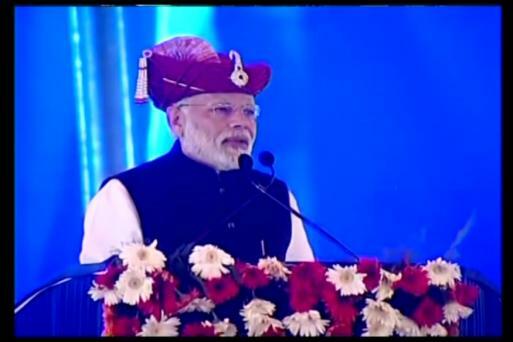 He also took potshots at the TMC's opposition rally in Kolkata while addressing a public function at Silvassa, the capital of the Union Territory of Dadra and Nagar Haveli. Speaking in Silvassa, Narendra Modi said it's natural for the opposition to get angry as he stopped them from "looting the country". Representing the Congress at a mega gathering of opposition parties here on Saturday, Mallikarjun Kharge said party chief Rahul Gandhi and UPA chairperson Sonia Gandhi had sent their good wishes for the rally. 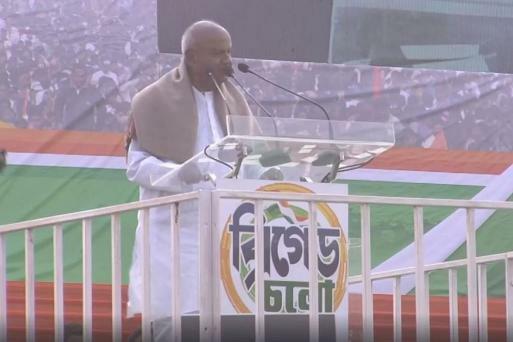 At the rally, Kharge, the leader of the Congress party in the Lok Sabha, read out a message from Sonia Gandhi, highlighting the "crisis" looming over the country with farmers and fishermen living under immense strain. Former TMC leader termed the opposition rally as 'circus'. "Various jokers and lying artists coming together to destroy India again," he wrote on Twitter. 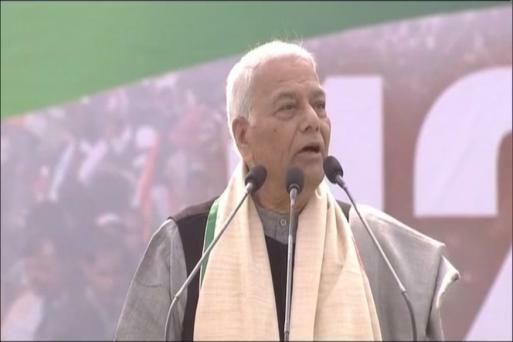 At the rally, former Union Minister Yashwant Sinha came down heavily on the Narendra Modi government saying that this was the first government after Independence which has been playing "mischief" with the developmental statistics. Sinha who quit the BJP recently said, under the present regime praising the government was "desh bhakti"(patriotism), criticising it is "desh drohi" (sedition). Yadav reminded that in a democracy people make the final decision; he made an appeal to stop the BJP from coming back to power in various states. Former Prime Minister H D Deve Gowda Saturday said with the general elections close at hand, the opposition parties should forget their differences and come together to fight the BJP unitedly. The Janata Dal (Secular) supremo said a small group of senior leaders should be formed to decide on a roadmap on how they will ensure good governance. The herculean task of seat sharing for the coming Lok Sabha elections has to be addressed to ensure direct fight against the BJP, he said. There is courtesy in politics, but BJP does not follow it; those who are not with BJP are called thieves, Mamata Banerjee said at the rally. Rajnath Singh, Sushma Swaraj and Nitin Gadkari ignored in BJP; if it wins the LS polls, they will be ignored again, claims Mamata Banerjee. At United India rally, Bengal chief minister said that the end of the BJP has begun. "We will hold the next meeting at Brigade after we win the elections. I invite all of you in advance," said Mamata. She ended her speech by chnating slogan "Badal do Badal do Dilli ka sarkar badal do." "BJP has two seats in West Bengal. They will lose that very soon. Just wait and see how our allies will do in the upcoming elections. I urge Hardik and Jignesh to keep moving ahead. There will be no achche din for BJP. I am not concerned about who becomes the PM, I just want BJP to go," says Mamata Banerjee during United India rally. The Congress leader said the biggest beneficiary of vote division is the BJP. "This meeting has been forced by historical necessity. You ask who's the leader of the Opposition. There are so many people on the stage. Can't you see? We have many leaders unlike your party. They have destroyed the image of CBI that we used to respect before. Officers are not bad," says Mamata Banerjee. "There is a lakshman rekha in politics that you should not cross. PM targeted everyone. Then why should we not target him? He claims he is clean but look at all the scams his govt is involved in. Things change, even weather changes, then why shouldn't the government change," says Mamata Banerjee. "Modi's expiry date is over just like your pills. We are now here to build a new India," says Mamata Banerjee during United India rally. "Modi is factory of lies and a distributor of lies. We need to work together to fight Modi. I heard he is coming to Bengal to mislead people. Don't believe him. I would like appeal all Biharis in Bengal to beware of BJP. Take revenge from Modi," Tejashwi says. Lalu Yadav's son and RLD leader Tejashwi Yadav is addressing the gathering in Kolkata, blames Modi and Amit Shah for his late arrival. "With this huge gathering, Modi will have sleepless nights from now onwards. ED, CBI are all coalition partners of BJP. They hatched a conspiracy and sent my father to jail with the help of CBI," he says. "HAL was not given the contract to build aircraft. Please come clean with facts on Rafael otherwise u have to listen: Chowkidar Chor Hai, Chowkidar Chor Hai, Chowkidar Chor Hai," says Shatrughan. "Demonetisation was announced in haste. They announced without considering the people and other senior party leaders. Even the finance minister was not kept in the loop before announcing demonetisation. Women, who had accumulated some wealth for their families' benefit, were left in lurch when note ban happened. They lost crores due to it," says Shatrughan, adding that even before people could get over demonetisation, GST happened. "Even before being a member of the Bharatiya Janata Party, I am leader of Bharat. So whatever I say or do, is for the people and for their benefit. I am answerable to them. Hence, I try to show BJP a mirror so that they understand that it's a democracy and they cannot do such injustice. Yashwant Sinha tells me that BJP will now throw me out of the party. But I am not scared because I am a people's man," Shatrughan says. We Present Views of the NEWS: Shatrughan | Bharatiya Janata Party (BJP) rebel leader and veteran leader Shatrughan Sinha says, "I haven't seen such a huge crowd in the recent past. It's the magic of our leader, Mamata Banerjee. We have gathered here to present the views of the NEWS (North, East, West and South)." Mamata Banerjee speaks at the ‘United India’ rally in Kolkata on Saturday. Earlier, former J&K chief minister Farooq Abdullah called Electronic Voting Machines (EVM) 'chor' machines and said opposition leaders must urge the poll panel to do away with them. Earlier, ex-BJP leader and former finance minister Yashwant Sinha urged opposition parties to make the country’s “failing economy” as the election issue in upcoming Lok Sabha polls. At the rally being hosted by Trinamool Congress supremo and West Bengal CM Mamata Banerjee, Sinha said the opposition parties must counter the BJP’s attempt to paint the opposition unity as a single-agenda bloc. The Kolkata rally was earlier opened by Patidar agitation leader Hardik Patel and Dalit leader Jignesh Mevani, who warned that the country is going through an “unprecedented crisis”. More than 20 national leaders, including former prime minister HD Deve Gowda, former Union ministers Yashwant Sinha, Shatrughan Sinha and Arun Shourie; three present chief ministers Arvind Kejriwal, Chandrababu Naidu and HD Kumaraswamy; and former chief ministers Farooq Abdullah, Omar Abdullah, Akhilesh Yadav and Gegong Apang will attend the meeting, TMC sources said. Most of them have already arrived in the city. "I have met Deve Gowda-ji, Hemant-ji (Hemant Soren of Jharkhand Mukti Morcha) and Akhilesh Yadav. I will meet other Opposition leaders too," Banerjee told reporters. With Bharatiya Janata Party's recent defeats in the Hindi heartland states of Rajasthan, Madhya Pradesh and Chhattisgarh, Banerjee has raised the pitch to be united against the saffron party in the 2019 general election. Bahujan Samaj Party general secretary Satish Chandra Mishra, Nationalist Congress Party supremo Sharad Pawar, Samajwadi Party supremo Akhilesh Yadav, National Conference president Farooq Abdullah, too, have already arrived. Large-scale preparations have been made to ensure that it is a complete success. Besides the huge stages, 20 watch towers have been erected and 1,000 microphones and 30 LED screens put up so that the spectators can see and hear the speeches of the leaders clearly. Lakhs of TMC supporters and workers are expected to attend the rally and huge numbers of them from various corners of the state have already started pouring into the city. They have been put up in the outskirts of the city and in some auditoriums and stadiums. Hundreds of TMC volunteers will be on the grounds to take care of supporters. A thick security blanket has been thrown on the sprawling Brigade Parade Ground — the venue for the mega rally to prevent any untoward incident. As many as 10,000 police personnel will be deployed and around 400 police pickets have been set up to ensure foolproof security, police said. Policemen in plain clothes, personnel of the Rapid Action Force and Quick Response Team would be deployed at the rally venue. Police posting would start from as early as 4am with senior officials in the rank of assistant commissioners in charge of the five dais set up for the rally, a senior police officer said. "We are expecting a huge turnout from all parts of the state as well as from the country. There will be so many important dignitaries. We have arranged foolproof arrangements for their security," he said. Separate entrances have been arranged for the five dais that would be looked after by around 15 teams of police officers, he said adding that commandos and other officers would also be posted there. "We are not allowing any food stall near the venue. Only water tanks are being allowed at a safe distance from the dais. Nobody will be allowed to light fire near the venue for cooking or any other purpose," the officer said. Vehicular movement in and around the venue has been either restricted or directed. "VVIPs will be taken in small cars to the venue. Other would have to park their vehicle at designated parking lots. We will not let anybody to drive motorbikes to the place," he said. A central monitoring desk has been set up at the Kolkata Police headquarters to keep a watch on the proceedings of the rally.